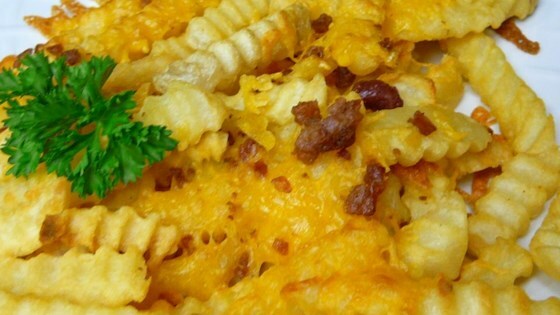 "Easy and fast, these Cheddar cheese fries are served with bacon and dipped in ranch dressing." Preheat oven to 400 degrees F (205 degrees C). Place a piece of aluminum foil over a baking sheet; spread fries in a single layer on baking sheet. Bake in preheated oven until golden brown and crisp, 15 to 20 minutes. Sprinkle fries with cheese and crumbled bacon. Broil until cheese is melted, 1 to 2 minutes. Serve with Ranch dressing. Duck fat is the key to incredibly crisp baked steak fries. I really enjoyed this because it was so easy to make. I added jalapeno peppers though because I like a little kick. Just wanted a quick snack tonight because I was not that hungry....delicious! Made this with OreIda's Golden Crinkles and mixed cheese-cheddar and mozzarella! This is a great recipe, I really loved it. Only trouble is, I can't stop making it! Thank you for a good snack or side with burgers. for a vegetarian version I sprinkled on crispy onions, brown sugar and smoked paprika in place of the bacon -- the cheese went on last -- yum yum -- not guiltless, but meatless!